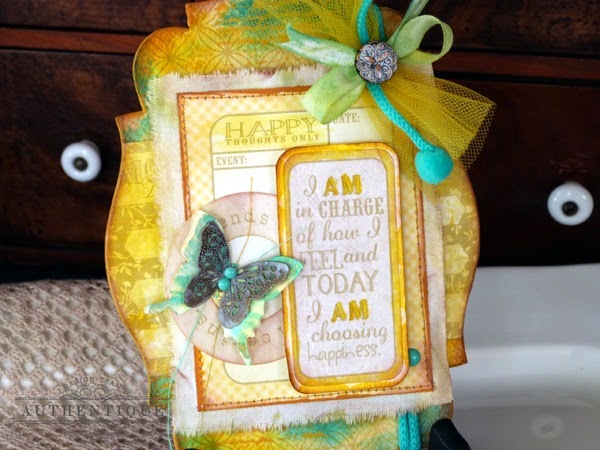 Hi everyone, it's Audrey, and today I have a fun inspirational project and tutorial to share with you featuring our beautiful new Faith collection. 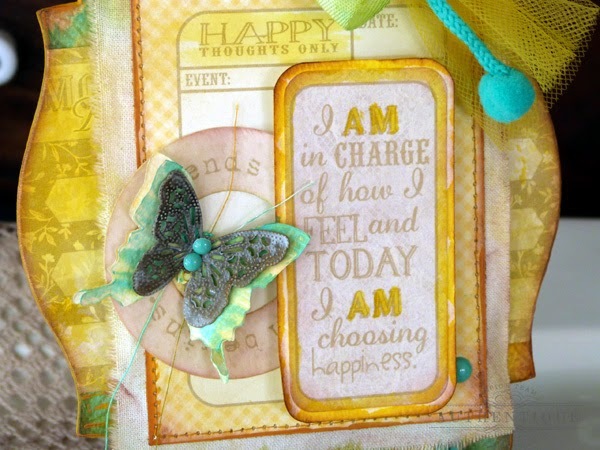 I am in charge of how I feel and today I am choosing happiness! Don't you love that? Out of all the pieces of this gorgeous new collection, that sentiment spoke to me the most, and I immediately knew I wanted to create an inspirational piece that I could set out in my home to remind me of this important fact every single day. Part of my current path to happiness includes exploring my artistic side, so for this project I pulled out a variety of materials and mediums to play with, including paint and inks, fabric and trims, and even a bit of metal. And the result is this fun mixed-media art plaque, perfectly suited to my personal style, that shows a whole other side to this faith-based collection. I had so much fun creating this project, and wanted to share my process with you. If you'd like to make your own inspirational art plaque, here's all you need to do. If you're anything like me, you probably have a stash of unused chipboard mini albums, like this pretty one I used from Maya Road. I loved the shape and size to this one, and thought it would make a fabulous plaque when using just one page from the album. 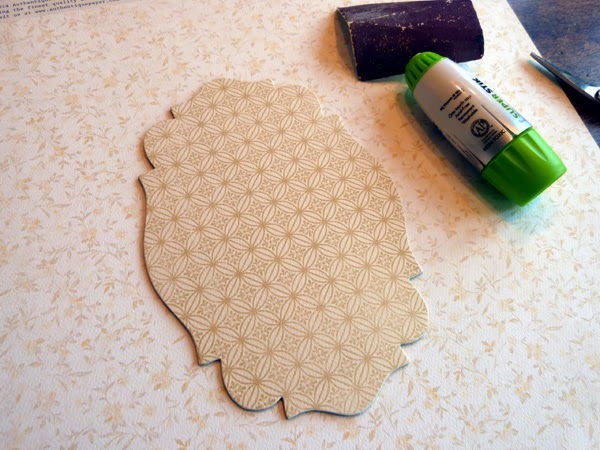 First step was to remove a single chipboard page, then trace around it onto Faith 12x12 patterned paper. 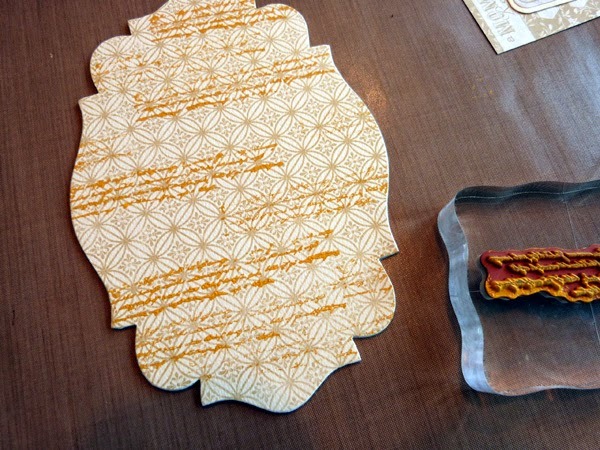 Cut the traced shape out then adhere the paper to the chipboard base. I recommend using Therm O Web's SuperStik glue stick for a nice uniform coating of adhesive. Sand the edges to remove any excess paper. Select a stamp image that you would like to use on your background. I chose a script stamp from Authentique/ Hampton Arts. Ink the stamp with paint, and stamp image randomly across the entire background. The paint will act as a resist to any ink you add on top. As you can see, I stamped my image several times between inkings to get both light and dark images. 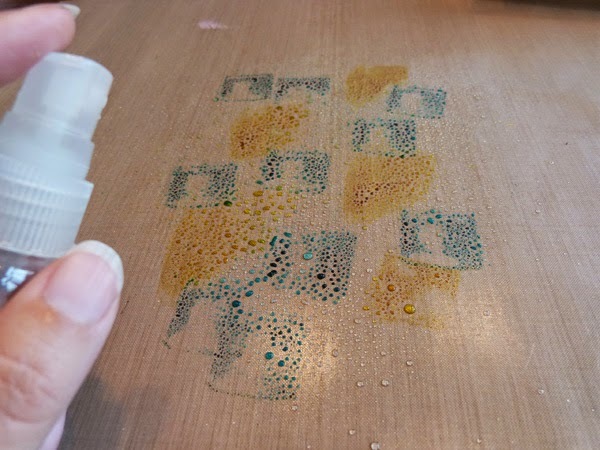 Dab Distress Ink Minis onto a craft sheet. I used Peacock Feathers and Mustard Seed. 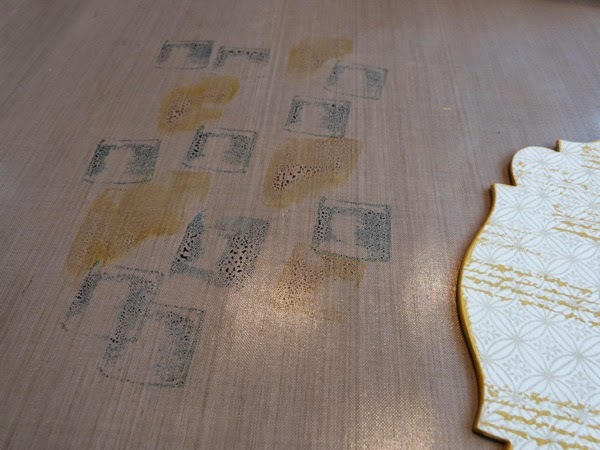 Spritz the ink liberally with water, then press and swipe your chipboard piece through the ink. 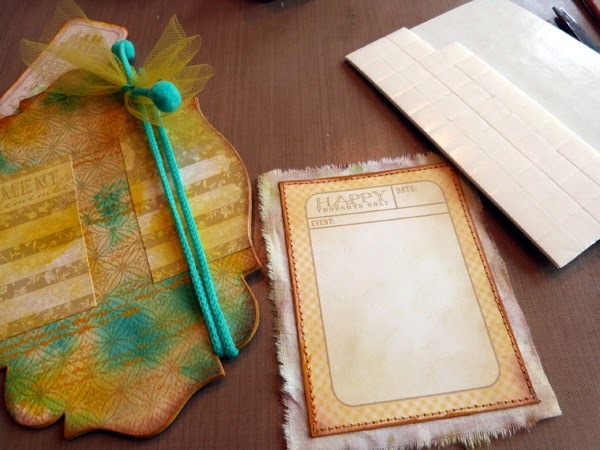 On a clean spot on your craft sheet, dab a bit more of the Mustard Seed Distress ink, and swipe an Enhancements journaling card through the ink. Allow both pieces to dry completely. The journaling card wasn't big enough to span the entire width of my background, so I cut the piece in two before adhering the card to the sides of my plaque. We'll add something else in the center, so don't worry about the gap. 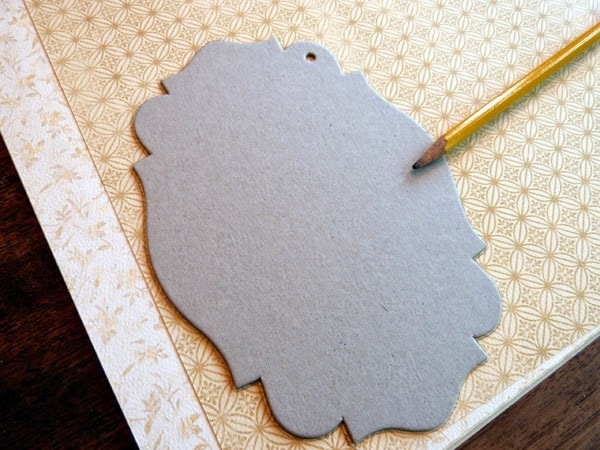 Trim the paper from the edges, and sand to remove any excess. 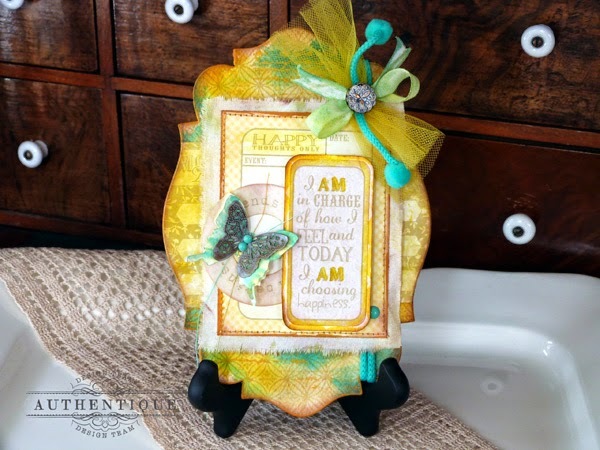 Ink the edges of the plaque with Vintage Photo Distress ink. Tie trim around the right side of the plaque. Trim another journaling card from the Enhancements sheet. Ink the edges, then machine stitch the card to a panel of cotton fabric. Adhere cotton panel to the center of the plaque using foam adhesive for dimension. Drag white twill trim through any remaining ink on your craft sheet and allow to dry. Tie trim into a bow and adhere bow to the top of the plaque. 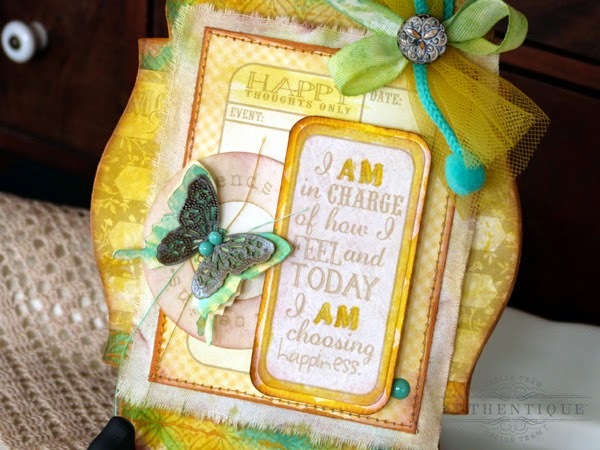 Layer the sentiment cardstock sticker onto Faith patterned paper and trim around it. 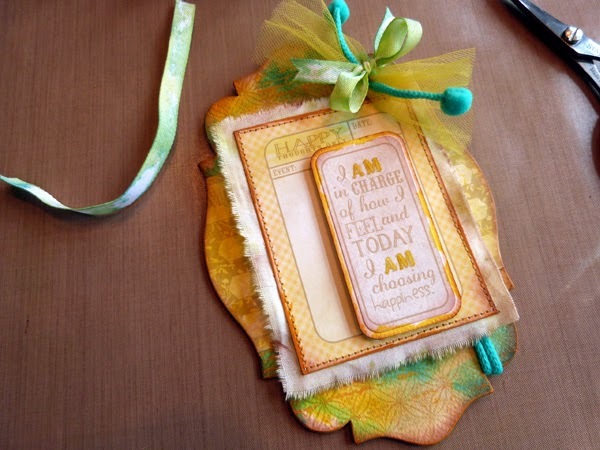 Using a fine tip paintbrush and the Mustard Seed ink, add watercolor detail to parts of the sticker and journaling card. Adhere sticker to the journaling card using foam adhesive. Apply round cardstock sticker to the left side of the Enhancements card. Die cut two butterflies from Faith patterned paper using the Sizzix Mini Butterflies movers and shapers die. Watercolor one butterfly with Peacock Feathers Distress ink. Stack the two butterflies together, with inked one on top, and machine stitch down the center, leaving the threads long on both ends. Lightly bend up on the top butterflies wings, then adhere to the circle sticker. Add white Patina ink to a Maya Road metal butterfly and spread the ink around with your finger. 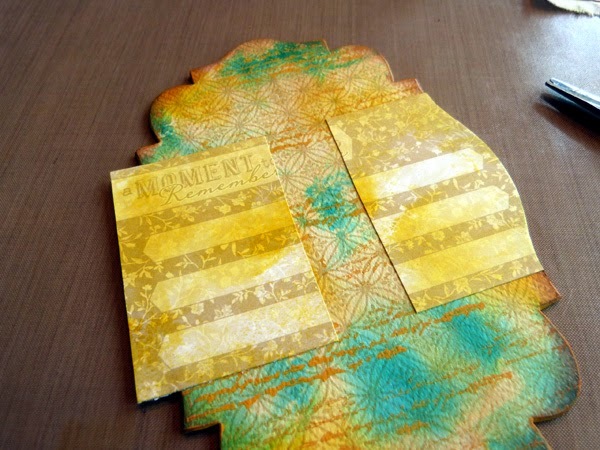 Allow the ink to dry, then adhere the metal butterfly onto the paper one. Ink a metal button the same way you did the butterfly, and adhere to the bow. Add a few candy dots to finish things off. 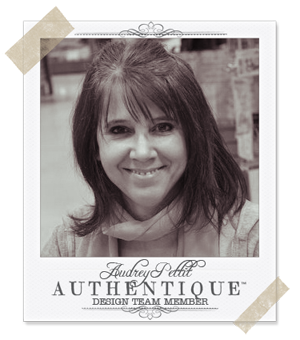 Audrey, your work is always simply perfect! This plaque is absolutely gorgeous! Very nice. Thank you sincerely for showing me how to make it. Cant wait to try. This turned out fabulous! I love the sunny colours and the pretty butterfly. Love the plaque and especially how you added color to it! Thank you for the inspiration and the tutorial!! That is SO beautiful! I am very inspired by this lovely work of art! Thanks again for the great tutorial! That background is stunning, love the colors, great pictorial. Wow! The colors are this plaque are stunning!! Love the project & this new collection. TFS! You are very talented! Stunning tutorial & such a pretty project with awesome colors love it !! !